Do you know what Supreme is? It’s this ultra-hip and uber-expensive brand of clothing and accessories. Fridays I spend in SoHo on Lafayette Street, sipping La Colombe coffee why my daughter plays basketball at the Chinatown YMCA with a bunch of other homeschooled kids. The cafe is right next to Supreme’s flagship store – where 12 freakin’ security guards manage a massive (segmented around two other blocks) daily line. Today was the last day of Easter school break and the line was especially long. 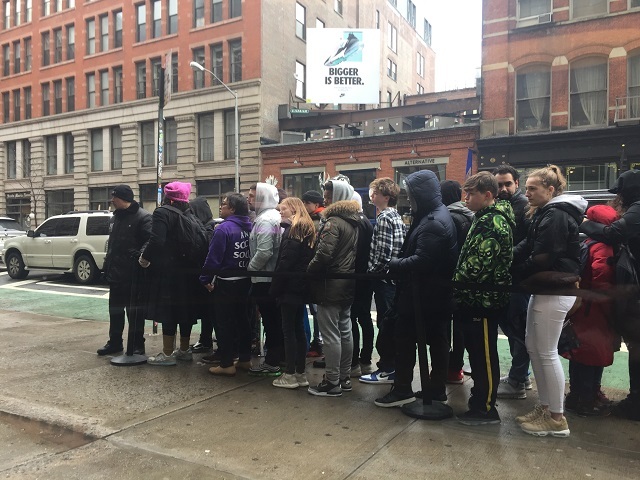 These juveniles and millennials waited in line for hours for the privilege of paying like $400 for single sweatshirt or $3,900 for the Louis Vuitton backpack pictured below. He’s the guy that just about put me into cardiac arrest. 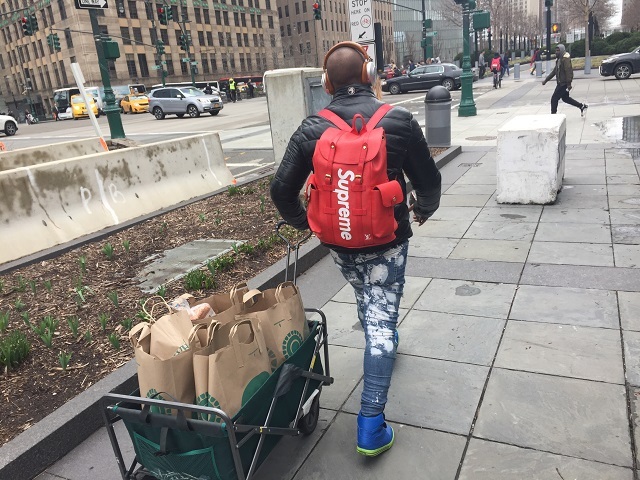 You see he is an “Instacart shopper” making a grocery deliver working for minimum wage, NOT an investment banker or anyone else who clearly should be dropping coin on ridiculously over-priced accessories. When I got home I googled that backpack and saw it re-selling for $7,000-8,000. HOLY MOLY! But I’m pretty sure he’s wearing a Canal Street (Chinatown) counterfeit. The metal snaps are supposed to be red, not golden. Whatever. I’m still sure he’s paying too much, for too little, for weird reasons that I just could never wrap my mind around. Don’t get me wrong, I TOTALLY respect the people, including many really young kids, who are buying the goods and reselling them to their classmates. But it’s hard not to shake your head into whiplash thinking about all those people lining up, in dire weather, and waiting all morning so they can buy 2 items – yeah they limit you in the store to a couple items.